A funny thing happened to me recently. Funny things happen, I know, but what isn’t so usual about this funny thing is that it involved a mental breakdown on my part, a series of bizarre coincidences, and the chance discovery of a new favorite food. Let me start from the beginning. Those of you who read Seattle Bon Vivant might recall a mention she made a couple of weeks ago of the new Seattle outlet of Oliviers & Co, a French gourmet food store that has recently opened their first shop in the Pacific Northwest. Luckily for me, while I was there and a couple days before a scheduled trip into the city (to dine with the gorgeous and talented Molly, among other things), Viv gushed about a green tomato jam she had purchased at O&Co. Won over by her swooning description, and never having heard of this shop before, I decided to swing by and take a look — and of course maybe pick up a jar of that much-lauded green tomato jam. She led me across the room to a small table hidden away in a corner. On the table lay literally dozens of jars, many of them half-empty. I caught my breath and salivated – it was a tasting table. Before I knew what was happening, I had three miniature plastic spoons in my hand, each of them holding a blob of shiny, dark brown paste. “This is our standard olive jam”, she began, watching me closely as I raised the first spoon to my mouth. I felt my knees going weak – it was incredible. Sweet and silky, the taste was of fruit and honey and perfume, melting to a complex bouquet of savory olives and briny salt. It reminded me of Moroccan food and the delicate interplay of sweet, spicy and savory, or perhaps of a complex Indian fruit chutney. The second spoon contained a taste just as good, but further enhanced with the delicate fragrance of lemon. The third one was remarkably different: the smooth texture was interspersed with tiny pieces of toasted pinenuts and a caramelly, nutty undertone permeated the mixture. I stood there in awe, looking at the three varieties and wanting them all. But I didn’t have time to linger, because the tasting was moving on. The sales lady, who had introduced herself as the store manager Suhara by that point, was mixing up potions for me to try. One that she said was very popular was a combination of olive jam, syrupy aged balsamic vinegar and a very unusual extra virgin olive oil that had been pressed with ripe mandarins. “People use this to glaze meat,” she said. The flavors were exploding all over my mouth. I tried pestos and truffle sauces, vegetable preserves and tapenades, about ten different varieties of olive oil, and even a spoonful of green tomato jam (which by this point, didn’t even cause any bells of recognition to go off in my head – I didn’t realize until after I’d left the store that I had finally tasted what I’d gone in there to find). Every product was exquisite, but the thing I couldn’t get out of my head, even as I tasted everything else, was the olive jam. It was really like nothing I had ever tasted before, and I knew that even if nothing else would accompany me out of that store, a jar of olive jam would. Realizing I had been in there so long I was running late for my dinner with Molly, I plonked down the twelve dollars and clutched my jar of jam like it might run away, thanking Suhara profusely and promising I would be back to buy more just as soon as I could. The story doesn’t end there, however. Convinced I had made the culinary find of the century, I jealously guarded my olive jam and stashed it away in my luggage to bring back to Scotland, imagining all the exciting ways I was going to use every last smear. A couple of days after the O&Co visit, and still several days before my departure, I found myself wandering around an outlet of Trader Joe’s. I was poking around among the pickles and mustards and oils, seeing what was new, when what should I spy but a jar of Sweet Kalamata Olive Spread?. Incredulous, I snatched it up. What were the chances, I thought. But then the next day as I was doing some food shopping for my family in their usual supermarket, something else nearly knocked me off my feet: nestled among the specialty cheeses that I had looked at a thousand times already was a single jar of Sweet Olive Jam produced by the Mediterranean food company Mt. Vikos. Of course I bought it, but really, what was going on? This was definitely more than a coincidence – somebody obviously was thinking there was a noticeable lack of olive jam in my life. How else to explain the chance encounters, the single jars waiting for me, the words put into my mouth? Suddenly these three precious jars I had acquired were seeming very small indeed. Who knew what the olive jam situation was back in Scotland? How could I go back to a life without it? I shuddered at the thought. Obviously I couldn’t take enough back with me, so there was only one solution. I would have to learn to make it myself. Because, as the old adage should have said, when life gives you olives, make jam – and when life gives you olive jam, make some more! Notes: I was grateful to have three different jams to deconstruct, in order to see what I liked and disliked about each. All three were surprisingly different from one another, despite the same premise. The Kalamata jam from Trader Joe’s was thick and chunky with large pieces of chewy jet-black olives; the ingredients basically listed just olives and sugar, which led to an incredibly pure and intense olive flavor. I realized Kalamatas have enough subtlety and complexity to stand up alone in a jam – I loved it, yet the nuances of flavor and consistency were not quite up to par with O&Co. At one-tenth the price, however, you wouldn’t have to twist my arm to make it a pantry staple of mine. The jam from Mt Vikos, in contrast, was made entirely with green olives, enriched with lemon, pomegranate juice and sugar and blended to a smooth, runny puree. Unfortunately I found it just a tad too sweet, the texture too loose, and the flavor too dominated by the more aggressive taste of green olives – but it was still delicious. The jam from O&Co (I bought the lemon variety, incidentally) had the longest ingredient list, containing both black and green olives, apples, lemon and honey, and compared to the other two, the best consistency and flavor. This was thus the gold standard, and the jam I tried to replicate. Note that while you don’t have to break the bank on olives, they should be of reasonably good quality to make a full-flavored jam (i.e. no canned California olives!). Your best bet is probably going to be a Mediterranean or Middle Eastern shop that sells olives in bulk. If you only have a choice between low-quality pitted olives and high-quality olives with pits, go for the latter and pit them yourself. 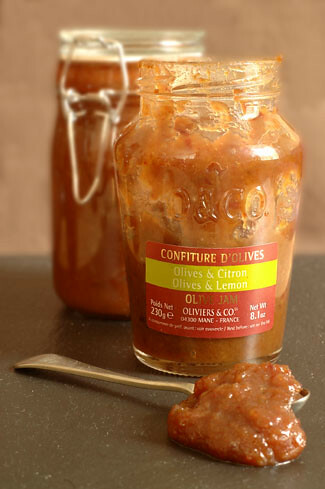 Also be sure to buy olives packed only in brine, not in oil or with added garlic and herbs. Edit: I’ve since determined that oil-packed olives actually work just fine, as long as they’re well-drained. I still wouldn’t go with anything flavored, though! Put all the olives in a large saucepan and cover with cold water. Bring to a boil over medium-high heat and boil for one minute. Drain completely. Repeat this process two more times – this should take enough salt out of the olives so that they’re only mildly salty. Set the olives aside and rinse out the saucepan. Add the sugar and 1 1/3 cups water to the saucepan and swirl to combine. Cut a couple of strips of zest from the lemon and drop them in the sugar water. Slice the lemon up very thinly (don’t worry about the seeds), and add the slices to the pan as well. Bring this to a simmer over medium heat and let it cook for about 8-10 minutes, or until it’s reduced to about a cup of liquid. Pour this through a strainer into a bowl, pressing on the lemon solids to extract as much liquid as possible. Return the liquid to the pan, adding the diced apple, honey and olives. Bring to a simmer once again and cook, stirring occasionally, just until the apples are soft and everything is very thick – about another 10 to 15 minutes (you can add a bit of water if it seems to be getting too thick). Remove from the heat and let cool slightly. With an immersion blender or a normal blender, process the entire mixture until it is velvety-smooth. It should be quite a jammy consistency already; if it’s runny you can continue to cook it a little bit more, but keep in mind it will thicken as it cools. Transfer to jars and refrigerate. I haven’t tested how long this keeps, but mine is a week and a half old and still going strong. Of course you can also serilize a couple of small canning jars and can them for shelf storage. And how to use this miraculous substance? I love this jam with cheese, particularly with hard pungent cheeses like Manchego or Pecorino or an aged farmhouse cheddar. In Scotland nice restaurants will often serve a cheese selection with oat biscuits and a homemade chutney – it would be perfect for that. I’ve also fallen in love with it on sandwiches with Italian dry salami and Emmenthal or Gruyere cheese and a bit of peppery arugula. Heaven. Well MelissaI dont know what I was expecting when I read the title of your post… but it definately wasnt that lovely little missive… I already feel like I wont be able to livewith out olive Jam in my future and I had never heard of it let alone tasted it before! Looks amazing — but where to find high quality olives that aren’t packed in oil? The best olives I can get my hands on around here are never in brine. Are the jars of brined olives any good? And would olive oil really make a difference? I suspect that during the boiling process it would simply rise to the top and get poured off with the water? Mmmmm sounds tantalizing. This would be lovely if used on an olive ciabatta loaded with arugula, shaved pecorino, cracked black pepper, roasted pine nuts, and drizzled with chilli infused olive oil. Hi Clare – Let me tell you, once you taste it, you won’t know how you’ve done without it! You might have an O&Co in Sydney, do you know?Hi Adam – My only hesitation about oil-packed olives is that sometimes they can be quite a bit saltier than the brine-packed kind – especially if they were oil-cured. It might work, though, who knows? I just used jars of Kalamata and Crespo green olives I found at Tesco and they worked fine. But if you find good quality oil-packed olives, why not give them a try and let me know how it goes?Hi Zarah – Yes, mine still hasn’t forgiven me for the olive jam – luckily I had to leave the shop before I could put it into a permanent coma! ;)Hi Equalizer – Your sandwich sounds AMAZING – maybe you could put one in the mail for me? ;)Hi Jen – Welcome and thanks! If you try this, definitely let me know how it turns out – I really appreciate feedback on recipes I’ve worked out myself. Seems counterintuitive that olives sitting in oil would be saltier than olives sitting in brine… Anyway, I’ll let you know when I get a chance to try it out. Sounds excellent! hi melissa, that looks and sounds really lovely, and like you say, a real treat with cheese. can just imagine it with a fresh little goat’s cheese too..
Hi Melissa, sounds like you had quite an adventure at o & co! I will have to keep my eyes open for a tasting bar, and I’ll make sure to have an empty stomach. The olive jam sounds fantastic. Im curious to know how your recipe compared to the o & co one you purchased? Were you completely satisfied with it? Hi Adam – I see your point, but I’ve had the experience with black olives that the salt-cured ones are quite a bit drier and saltier than the brined ones. Don’t know about green ones – in fact, I don’t know if they make salt-cured green olives at all. In any case, I’m really curious how it will turn out for you, so do let me know! Hi Paz – It was fantastic, and it’s really easy to make. Give it a try when you have the chance! Hi Nicky – I was a bit skeptical myself, but the combination really works. Even the simpler jam with just olives and sugar was really good. I haven’t seen any olive jam around Edinburgh yet, so maybe it’ll take a bit longer to catch on in non-Francophone Europe, but hopefully it will soon! Hola Melissa! The recipe looks fantastic—found your blog via Small Farms, and love it! Hi cookingdiva (or should I call you Melissa? 🙂 – Thanks for stopping by, you’ve just introduced me to your blog too! I too discovered the saucy little item happenchance. Chance encounter at the Trad’rs Joe. As it happens, they’ve discontinued it in my locale (San Francisco). Just discovered this today, which brought me to this search…don’t mind telling you…I’m feeling a litle salty now myself. I’m so glad you posted this information as I was a frequent Trader Joe’s patron in Southern California but have moved to the Midwest of the US to which there are none. I purchased the Sweet Kalamata Olive Spread before I moved and used it in an appetizer as a topping to toasted baguette with melted aged Grueyer…totally delicious, even to non-olive lovers as they had no idea that it was comprised of olives yet they enjoyed it thoroughly? Thank you for providing a recipe, looking forward to trying it! I, too, found this sweet olive spread at Trader Joe’s, and I’m SO disappointed that they no longer carry it. I made a fabulous roasted chicken dish with it: simply stuff gobs of it under the skin and roast. The recipe (which didn’t suggest a sweet kalamata spread, just a savory one) also said to add baby or small red potatoes to the roasting pan. The whole thing was heaven!So I guess I’ll try the recipe for the jam and use that instead. Hi Melissa, I discovered your site a few months back and have enjoyed coming for visits. Your entry about olive jam was so tantalizing that I asked for a jar at Christmas. I loved it, but it’s almost gone. Today, I finally cooked a batch according to your recipe. Oh, my! It’s so much better than O&Co! I saved a bit of the original jar for comparison: it seemed relatively tasteless. And last week I was so sad because it was almost gone! But your recipe has olives as the main ingredient, theirs has apples, so it makes sense that yours would have a richer flavor. Thank you. I would not have known how to go about this myself. And now I know what I’m giving my favorite foodies for Christmas next year. By the way, what does the sidebar "What’s In My Recipe Box" mean? Are these personal recommendations from you or a form of advertising?I hope you’ll be doing this site for a long time to come. Reading your entries is a bit like visiting a favorite friend in her kitchen. Marley, thank you for your lovely commment and for reporting back on this recipe – I’m absolutely thrilled you thought it was better than O&Co! Really, really great to hear. As for the recipe box links, they’re just some links to things I’ve bookmarked on epicurious – not personal recommendations per se as many of them I haven’t actually made yet, but things that sounded good to me when I ran across them. I used to change them often, but now get around to it only every couple of months. In any case, no paid advertising there. I can’t believe there is another Kalamata olive jam lover. I thought it was just me. I bought it at Trader Joe’s because I love olives. Tried it at home and …… woah! I kept buying it and found it so surprizing – so many ways to use it. I love it simply on toast with cream cheeze, yum. I can no longer find it at Trader Joe’s. Wah. Thank you for posting the recipe. I am eager to give it a try. Thank you so much for your dedicated research. I have been looking for this recipe all over to no avail and was considering doing some "reverse engineering" myself. I would have missed some of your tricks, so am delighted to have found your site. Hi, sorry it has taken so long to post this – I made your olive jam about 10 months ago and yes, not only does it taste great but I’ve kept a big jar of it in the fridge this whole time and it has not gone off, so it lasts for ages. I’m just getting ready to make another batch, as I am down to scraping the last bits out of my jar. I eat it, as you suggested, with cheese – I especially like it with goat’s cheese.I tried to get some of our friends here in Forfar to try it at Xmas time, but I’m afraid it didn’t work out so well – many are convinced that they hate olives so wouldn’t even try it. Sad – they don’t know what they are missing! Hi Bridget – Thanks so much for the feedback! I must say I’m amazed the olive jam keeps so long (I would never have the self-restraint to find out, ha! ), but it’s certainly good to know. And here’s hoping your friends have a change of heart – I’ve honestly never met anyone who didn’t like olive jam once they mustered the courage to try it! Usually, I buy my olive oil from Holy Food Imports because their products come from Israel, so the local supermarkets can’t really beat them in quality. Hi Melissa, I tried your recipe and love it. We're using it with only slight changes at my restaurant. The sweet-salty combo reminded me of many of the little montaditos I ate at a Barcelona tapas bar called Quimet i Quimet. So we're using it on a little canapé topped with a piquillo pepper, a boquerón, a dab of your olive mermelada (that's what we're calling it) and a pickled piparra pepper. Thank you. Hope you are well.